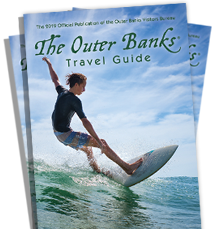 OUTER BANKS, N.C. – The millions of visitors who flock to the Outer Banks of North Carolina each year are coming to enjoy its renowned beaches and scenic beauty, but they’re also drawn by the area’s unique place in American history and the wealth of popular local attractions that tell its story. Explorers of both the here-and-now as well as the yesteryear find intrigue in the Outer Banks. After all, it is here that Wilbur and Orville Wright made the first powered airplane flight. It’s where English settlers in 1587 attempted colonization on Roanoke Island, predating Jamestown, Va., by 22 years and Plymouth, Mass., by 35. Today’s adventurers will find no fewer than nine major historical sites and cultural attractions to explore. Perhaps the Outer Banks’ most well known claim to fame is its designation as the “Home of the First Flight.” The Wright Brothers found the area’s terrain and wind conditions perfect for testing their powered glider; and, on December 17, 1903, they successfully flew their renowned flyer for 12 seconds, becoming the first ever to sustain powered airplane flight. Today, the site of their world-altering achievement is marked by a 60-foot granite monument dedicated in 1932 and perched atop 90-foot-tall Big Kill Devil Hill. Numbered markers indicate the distance of each of the four flights made that historic day. The site also hosts a visitors center with exhibits that include a full-scale replica of the Wright Brothers’ original plane, the “Wright Flyer,” and reproductions of the camp buildings used by the famed brothers in 1902 and 1903 – one used as a hanger for the 1903 Flyer and the other as a workshop and living quarters furnished with items much like those the Wrights used while there. Be sure to visit the 20,000-square-foot Centennial Pavilion, erected in May 2003 to commemorate the 100th anniversary of the Wright Brothers’ achievement. The semipermanent structure, which remains on site after the Centennial celebration, houses additional exhibits and a 1,000-seat auditorium. The exhibits depict various aspects of aviation and space travel as well as the Outer Banks at the turn of the century, including replicas and reproductions of equipment used by the Wrights. Operated by the National Park Service, the Wright Brothers National Memorial also features interpretive tours and a bookstore. The park is open daily except for Christmas from 9 a.m. to 5 p.m. from September through May and from 9 a.m. to 6 p.m. from June through August. Admission is $4 per person and free for individuals age 15 and younger. The Memorial is located at milepost 8 on the U.S. 158 Bypass in Kill Devil Hills. For more information, call the National Park Service at (252) 441-7430. Also operated by the National Park Service, the Fort Raleigh National Historic Site sits on 513 acres on the north end of Roanoke Island just three miles from the historic town of Manteo, N.C. Established in 1941, the park commemorates the first English attempts to colonize the New World from 1585 to 1587. Sponsored by Sir Walter Raleigh, the efforts ultimately ended with the disappearance of 117 men, women and children, a mystery that still remains unsolved. The site is acclaimed as the birthplace of Virginia Dare, the first child born of English parents in America before the colony vanished without a trace. Today, the park is home to a visitors center, museum, Elizabethan Gardens, “The Lost Colony” outdoor drama, historic tour trail, gift shop and picnic area. Its mission has expanded to encompass the preservation of Native America culture, the American Civil War, the Freedom’s Colony and the activities of radio pioneer Reginald Fessenden. Some of the park’s most popular visitor activities are: attending a live performance of “The Lost Colony” outdoor drama in the park’s Waterside Theatre; strolling through the Elizabethan Gardens, an accurately reproduced early English garden; and viewing the 17- minute film “Roanoke” at the visitors center to learn the background of the Roanoke voyages and Sir Walter Raleigh’s efforts to colonize the area. The park is open year round, except for Christmas, from 9 a.m. to 5 p.m. During the summer, when The Lost Colony outdoor drama is presented, the visitor center remains open until 8 p.m. Admission is free. For additional information, call the National Park Service at (252) 473-5772 or visit them on line at www.nps.gov/fora. The intriguing, unsolved mystery of “The Lost Colony” spawned America’s first and oldest outdoor drama in 1937, when North Carolina’s Pulitzer Prize playwright Paul Green penned a play depicting the famed colony of New World pioneers. The production was intended to run just one season; but Green’s adept blend of stirring music, energetic dance, drama and comedy – which he called symphonic drama -- opened to standing room only audiences and rave reviews. Soon, visitors were flocking to North Carolina’s remote Roanoke Island to see the play. President Franklin D. Roosevelt even watched a performance during the first season. So did Brooks Atkinson, drama critic for The New York Times, whose praise drew nationwide attention. With the exception of four years during World War II, when the coastline was threatened by prowling German submarines, “The Lost Colony” has played at Fort Raleigh National Historic Site’s Waterside Theatre every summer since. Some 3 million visitors have seen the show since its debut. Today’s theater-goers are entertained under the stars in the newly renovated 1,650-seat theatre with new sets and lavish costumes designed by Tony Award-winning costumer designer William Ivey Long. And acclaimed Broadway actor Terrence Mann adds his own theatrical flair to the show’s direction for the second consecutive season. Mann, who graduated from the North Carolina School of the Arts, performed in the production during the 1970s. The unique production is presented at 8:30 p.m. nightly, except Sundays, from early June to August 20th. Tickets are $20 for producer’s circle seats, $24 for adults, $23 for seniors, and $7 for children age 2 and over. Regular admission children’s tickets are half price on Monday nights. For tickets for more information, call the box office at the Fort Raleigh National Historic Site at (252) 473-3414 or visit the web at www.thelostcolony.org. Visitors who cross over a short bridge from historic downtown Manteo, N.C., enter a 25- acre island all its own. With its panoramic view of Roanoke Sound, Roanoke Island Festival Park is a celebration of history, education and the arts. Through its living history interpretation, exhibits and variety of visual and performing arts programs, the Park presents the evolution of Roanoke Island and the Outer Banks from the late 16th century to the early 20th century. Festival Park visitors are presented with myriad activities once on the island. They can climb aboard Elizabeth II, a sailing ship representative of those sailed in the Roanoke Voyages and sent by Sir Walter Raleigh to the New World in the 16th century. Interpreters dressed as Elizabethan sailors tell seafaring tales to bring the voyages to life. Next, visitors can explore the Settlement Site, a recreated military camp manned by historically costumed soldiers who are constantly on the lookout for Spaniards and Algonquin Indians. Visitors learn by doing as they explore the camp, tent and equipment. Or exploring the park’s picnic areas, fossil pit and marsh-side boardwalks. Festival Park is open year-round. There is no charge to visit the picnic areas, boardwalks, fossil site, art gallery or museum store; and parking is free. Most services at the History Center also are free. Admission to the park is $8 for adults, $5 for students and free for children age 5 and younger. For more information, call the park at (252) 475-1500, access its 24-hour events line at (252) 475-1506, or visit the web at www.roanokeisland.com. Those whose historical interests are more maritime in nature will enjoy a visit to the nearby North Carolina Maritime Museum in downtown Manteo, N.C. Dedicated to preserving and interpreting all aspects of North Carolina’s rich maritime heritage, this attraction offers a variety of educational exhibits and programs. Among the museum’s exhibits, visitors can view: artifacts recovered from the shipwreck of the Queen Anne’s Revenge, believed to be the former flagship of Blackbeard the pirate; a collection of more than 5,000 shells from 100 countries; a variety of equipment used aboard ship; fossilized remains of marine life and prehistoric land animals; venomous snakes of North Carolina; working watercraft, including a dugout canoe, flatbottom and spritsail skiffs and traditional small boats; commercial fishing displays about whales and whaling, oystering and fishing; and displays of waterfowl hunting and decoys. Also featured are maritime arts, crafts and photographs. On the waterfront across from the museum is the George Washington Creef Boat House, where visitors can observe such ongoing projects as the conservation, preservation, construction and restoration of wooden boats. In addition to its collections and ongoing live demonstrations, the North Carolina Maritime Museum conducts more than 300 public programs each year, including guest lectures, concerts, workshops and field trips. The museum is open 360 days a year on Monday through Friday from 9 a.m. to 5 p.m., Saturday from 10 a.m. to 5 p.m., and Sunday from 1 p.m. to 5 p.m. The Watercraft Center is open from Tuesday through Sunday. Museum admission is free. For details, call the museum at (252) 728-7317 or visit ncmaritimemuseums.com. Just a short drive from the North Carolina Maritime Museum is the North Carolina Aquarium on the northern end of Roanoke Island. Situated on 14 acres overlooking Croatan Sound, the 68,000-square-foot building houses seven major exhibits and 18 tanks ranging from 300 gallons to 285,000 gallons. The latter tank is 17 feet deep and roughly the size and shape of a baseball infield. It features 450 fish and a number of sharks; and a live webcam monitors the tank’s activity for Internet visitors. Also featured at the aquarium are two touch tanks, interactive exhibits, research space, a large auditorium and a gift shop. Outside is a nature trail, shoreline boardwalk with observation decks and mounted telescopes, and an excavation area where visitors can dig for fossilized shark’s teeth. When touring the popular attraction, one of only three state aquariums along North Carolina’s coast, marine lovers can touch a stingray or marvel at river otters swimming freely in their pond. They can see alligators, sea turtles, moray eels, snakes and other fascinating forms of marine life. There are daily dive shows, animal feedings, and a variety of educational program and videos, as well as craft classes and off-site field trips. Admission ages 3-12 years of age $6; 13-61 years old $8; 62 years and up $7. Open year round 9 a.m. to 5 p.m., closed Thanksgiving, Christmas and New Year’s Day. 252-473- 3494 or 800-832-FISH. To find more maritime history about the Outer Banks, visitors can head south to the Chicamacomico Lifesaving Station on N.C. Highway 12 near Rodanthe, N.C., on Hatteras Island. Built in 1874, the station is one of the first seven on the Outer Banks and one of only 12 that Congress established in 1873 for crews to patrol the beaches looking for ships in distress along the treacherous North Carolina coast now known as the “Graveyard of the Atlantic.” The stations were built at seven-mile intervals along the coastal area known as Chicamacomico, with each station patrolled by a crew of five to ten men on foot or horseback. Chicamacomico became the most famous of the stations, given its crews’ many daring rescues. The original station was converted to a boathouse, when the new shingle-style station and outbuildings were erected in 1911. The Coast Guard, which evolved from the U.S. Lifesaving Service, decommissioned the complex in 1954. The property was purchased at auction in 1978 and donated to the Chicamacomico Historical Association, which subsequently restored the complex according to exacting 1911 specifications. The buildings on the site today survive as one of the most complete U.S. Lifesaving Service/Coast Guard Station complexes on the Atlantic Coast. They now serve as a museum and gift shop dedicated to those who served to help people who were shipwrecked at sea. Exhibits display pieces of the hundreds of vessels shipwrecked off the coast of North Carolina during a 400-year time span, and a volunteer is on duty to answer questions. The Chicamacomico Lifesaving Station is open Tuesday, Thursday and Saturday from 11 a.m. to 5 p.m., from May through September. The station also is open on weekends during the off-season from 11 a.m. to 5 p.m., weather permitting. For further information, call (252) 987-1552 or visit www.chicamacomico.net. In addition to chronicling its rich maritime history, the Outer Banks has preserved Native American history through the Frisco Native American Museum & Natural History Center, which opened in 1987 on N. C. Highway 12 in Frisco, N.C. The attraction is operated by a non-profit educational foundation that takes visitors back in time to follow the development and achievements of the island’s earliest Native inhabitants. Dedicated to preserving Native American artifacts, art and culture, the museum’s nationally recognized collections are housed in a building with 100 years of history as a general store, post office and shell shop. Galleries filled with native art wind through the facility and include information and artifacts from Hatteras Island’s earliest inhabitants as well as from Native Americans across the U.S. Local finds include a dug-out canoe discovered on museum property as well as items recovered from the site of East Carolina University’s archaeological dig at Buxton Village. A gift shop, which complements the exhibits, spotlights works from more than 30 Native American artists and includes unusual and specialty items. In addition to traditional exhibits and guided tours, the museum’s activities include Native American workshops and seminars, special programs for the visually impaired, and special events such as its annual Inter-Tribal Powwow. Visitors also can enjoy the museum’s nature trails, which wind through several acres of beautiful maritime forest, and feature labeled specimens and exhibits, open space with benches for resting and roped walkways through wooded areas. The Frisco Native American Museum & Natural History Center is open year-round on Tuesday through Sunday from 11 a.m. to 5 p.m. and on Monday by appointment only. Guided tours are offered with advance notice. For details, call the museum at (252) 995-4440 or visit them on the web at www.nativeamericanmuseum.org.